We deliver anywhere in the UK. We charge £4.95 inclusive of VAT on all orders. Orders are sent within 1 to 3 days by Royal Mail first class post, special delivery, standard parcel or sign for services. We process your order the next working day after we receive your order. We will normally dispatch your order to you in 1-3 business days. Please allow 5 days in busy periods. As a small company, we will try our best to dispatch an urgent order on the day of purchase. Please telephone us on 07733 001773. If your item is not in stock, we will contact you to confirm that you wish to go ahead with the order. If so, we will back order for you. You will not be charged until we ship the order. All prices displayed are inclusive of VAT when vatable. You can order with confidence with PayPal. You can either pay through your PayPal account if you have one or use a credit or debit card. Credit card numbers are encrypted using 128 bit encryption and are never sent unencrypted over the internet. We do not, at any point see your credit card numbers unless the order has been taken by telephone. We do not store credit card numbers. All of our products are guaranteed for 28 days. If a product is faulty, please send it back to us and we will replace the product or give you a full refund. 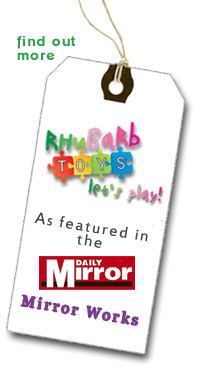 Rhubarb Toys will collect information about you for the purpose of processing your order and to provide you with a better service. We will use your data in accordance with the Data Protection Act 1998. You can return the products to us for any reason within 7 days of purchase. Please contact us first before returning any product and send the products in their original packaging. You will need to cover the return cost of delivery. Please obtain proof of postage otherwise we cannot refund should an item not arrive. Items on sales cannot be refunded but returned for a credit note. For damaged products, please return the products to us within 28 days, and we will offer a replacement.